Have lunch first thing (turn it into brunch) so you get the freshest and best selection plus enjoy the bistro setting at its quietest time, then take the 1 hour cruise. We are comparing Bistro-Style Seine River Dinner Cruise Tour Prices from leading ticket suppliers and Try to find you Cheap tickets prices on the market. The sightseeing boat is completely glass covered, including the roof, so you can enjoy 360 panoramic views as you cruise down the River Seine taking in the iconic sights of Paris. Audio commentary is provided via headphones in 11 languages - English, French, Spanish, Chinese, Dutch, German, Italian, Japanese, Polish, Portuguese, and Russian. 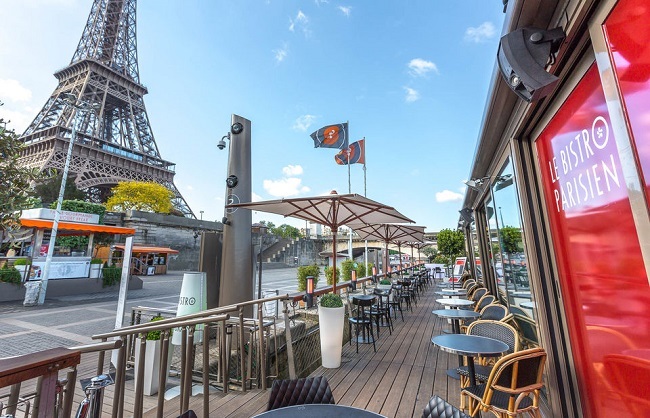 The 3 course lunch is held at the elegant Bistro Parisien located on the quay and has stunning views of the Eiffel Tower. Though subject to change, the seasonal French cuisine can include starters of tiramisu-style tomato confit and feta cheese, pressed duck terrine with onion and raspberry chutney, red bell pepper gazpacho, soft-boiled egg and mini baguette with olive tapenade. Main dishes could be pan-fried hake fillet with green risotto and a prawn emulsion, guinea fowl supreme with seasonal vegetables, or sirloin steak with confit shallots and fries. For dessert you might enjoy chocolate cream with caramelized almonds, strawberry and lemon curd tartlet or vanilla and raspberry iced Vacherin cake. The kids are also catered for with a set menu of pasta or chicken with fries followed by ice cream or a chocolate cream dessert. All lunches come with 1 free drink. A great way to spend a relaxing afternoon on and by the River Seine. Perfect for first time visitors, especially those who are celebrating a birthday or other special occasion. Good for the whole family with kids having a special kid-friendly set menu. Your Experience With Bistro-Style Seine River Dinner Cruise Tour? Make your way to the foot of the Eiffel Tower to Port de la Bourdonnais where you'll find the Bateaux Parisiens boat and the Bistro Parisien. Decide if you want to do the 1 hour cruise first or enjoy lunch first, and exchange your voucher at the ticket office. The 1 hour sightseeing cruise takes you on a round-trip past the cities most iconic sites including Notre Dame Cathedral, The Louvre, Les Invalides, Musée d'Orsay, Grand Palais, and so much more on a comfortable glass-covered boat providing you with panoramic views. With audio commentary provided via headphones in 11 languages you'll be able to learn all about the famous sights you're passing. A photographer is onboard so if you want some professional photos to remember this special moment you can purchase either a print or a memory stick of photos to look back on for years to come. The 3 course lunch at the bistro is self-service and includes a drink whether you opt for a soft drink, a beer, or a glass of wine. Tuck into freshly prepared and seasonal French cuisine as you enjoy the views of the Eiffel Tower and watching the boats on the water - There's no better way to spend a relaxing afternoon in Paris! What Bistro-Style Seine River Dinner Cruise Tour Includes? 1 hour sightseeing cruise with audio commentary. 3 course bistro style self-service lunch. 1 drink - A soft drink, a beer, or glass of wine. If the boat has an open top deck and you want to get the audio commentary, be sure to sit downstairs inside. Sit at the front to avoid the noise of the engine at the back. Travelers Reviews about Bistro-Style Seine River Dinner Cruise Tour? Travellers talking about this cruise on Trip advisor and Get You Guide all say that it's well organized with friendly and polite staff and that it's a great way to enjoy Paris - Allowing time to rest those weary feet after a morning of sightseeing! Everyone says how good the bistro lunch is though some people report having to pay for drinks, not getting the first one free. But the quality of the food made up for that, travellers saying the food is 5* and agreeing that it's much better than they expected it to be. In their own words people have described it by saying "The lunch was outstanding and the cruise was Awesome. Worth the money" "Good food and attentive service. We celebrated a birthday of one of my friends and everything was excellent" "Great value for money. Very relaxed cruise followed by excellent food." The restaurant is elegant and relaxing and allows travellers to enjoy a lunch soaking up the lovely views of the river and the Eiffel Tower. The 1 hour sightseeing cruise also gets good reviews though sometimes the boat changes route and doesn't go past the Notre Dame cathedral, this depending on time, traffic on the river, and tides. Overall, travellers are very happy with this combo ticket and say the value for money is excellent and that they would recommend this trip to others and do it again themselves. You'll need to queue up at the ticket office on the quay to exchange your voucher for a ticket before boarding the cruise. Duration: 1.5 hours segway tour + 1 hour river cruise.